Is Your House a Healthy House? Your kitchen floor is so clean that “you could eat off of it” – right? Hold on! Did you know that most floor cleaners contain ammonia which is a corrosive and irritates the skin, petroleum solvents which damage mucus membranes, and even glycol ethers, known to cause tumors, and damage internal organs and bone marrow? Does your dog eat off of your floor? Does your bird run across the kitchen to play with its favorite toy, does your cat lounge by the water fountain like a big cat of the Serengeti? Our pets do all of the above, but safely. How about you? Is your clean kitchen floor poisoning your best furry, feathered and even scaly friends? Watch labels – including those from so called “green” products. Products that contain detailed dilution instructions should be headed. Be especially careful of items delivered in a spray bottle, and yet have dilution instructions that belie their apparent “ready-to-use safeness” as a spray item. There are products labeled “non-toxic” and “biodegradable that contain many dangerous substances, including 2-butoxyethanol, a solvent absorbed through the skin that damages red blood cells and irritates eyes. Check labels. Check for dllution instructions. For example, Simple Green Concentrated cleaner has instructions for dilution for almost every task. This product comes in a spray bottle! This would seem to imply that it’s “ready to use”, and yet even the instructions on the bottle indicate this is not the intended use for the product. Many multi-surface and floor cleaners contain nonylphenol ethoxylate, which is banned in the European Union, and now in the State of California. This is a hormone disrupter and is toxic to fish and other aquatic life. Yet your pets walk across this with bare paws, and often lick food off of the floor that has been treated with this. 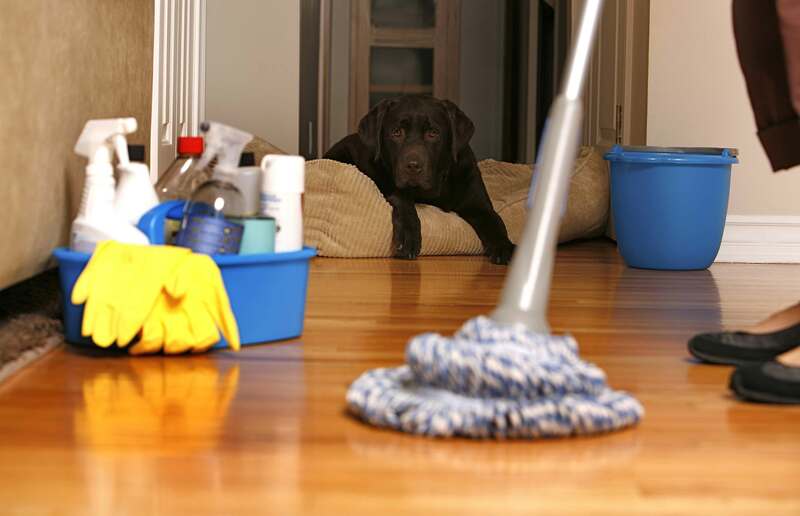 Floor cleaners also frequenetly contain DEGME, also called methoxydiglycol, in extremely high concentrations, often highly exceeding the concentrations allow in other countries. Toilet bowl cleaners contain corrosives that can damage the eyes. Toilet bowl disks are usually full of chlorine, and the labels indicate they “may be fatal if swallowed.” A pet could confuse a disc with a plastic chew toy. Even so called “fume free” oven cleaners have warnings similar to “Vapor harmful… open windows and doors or use other means to ensure fresh air entry during application and drying.” If you have birds or other animals with delicate respiratory systems, these items are extremely dangerous in your home. Many of the spray cleaners sold in the US contain ammonia, and other asthma inducing ingredients. Most products delivered in powder formula emit “chemical” clouds, often invisible, including formaldehyde, benzene, chloroform and toluene. Many products do not list their ingredients on their labels. Do your own research. A great resource can be found at the Environmental Working Group. Want to know more? Request our “Healthy Pets Guide” below to get information on healthy alternatives to mainstream cleaning products that endanger your family and your pets!